Experts separate fact from fiction to quell unfounded rumors. 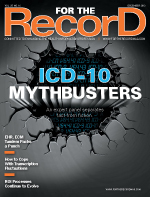 Less than one year remains before the official implementation of ICD-10, yet myths about the new coding system continue to persist. With all of the information—and misinformation—swirling around, it’s time to set the record straight and separate myth from fact. Below are several statements concerning the ICD-10 transition, each of which is determined to be either fact or fiction by an expert panel. However, the Centers for Medicare & Medicaid Services (CMS) has stood firm on the October 1, 2014, deadline and given the industry no reason to think there will be another delay, she adds. ICD-10-PCS will replace CPT. Contrary to some physicians’ beliefs, nothing about physician CPT billing for professional services will change, says Lynn Kuehn, MS, RHIA, CCS-P, CEO of Kuehn Consulting in Waukesha, Wisconsin. ICD-10-PCS is required only for inpatient hospital procedures and will not replace CPT. Current documentation won’t support the assignment of ICD-10-PCS codes, but Kuehn says documentation may already include many of the details necessary for ICD-10-PCS. “A lot of it is there because surgeons have to report a CPT code, and much of it is similar,” she says. However, there are inconsistencies in the terminology of ICD-10-PCS and CPT. For example, a surgeon may make an incision to introduce a catheter for a heart procedure. ICD-10-PCS doesn’t consider this an open procedure even though the surgeon may document it as such; it’s considered a percutaneous procedure in ICD-10-PCS, according to Kuehn. Another potential problem is that physicians use product names when referring to devices, while ICD-10-PCS instead opts for general descriptions. Health care data can enhance disease management programs, drive better outcomes, price procedures more accurately, and boost quality—all of which supports health care reform, says Fletcher Lance, MBA, vice president and health care lead at North Highland, a consulting firm in Nashville, Tennessee. A hospital’s service lines often dictate these fairly predictable codes, ones which hospitals should focus on when prioritizing clinical documentation improvement efforts, Lance adds. Queries will increase significantly with ICD-10-CM/PCS. This remains to be seen, experts say. “I think they’ll increase in the first six months because old habits are hard to break, but after that we should start to see a decrease,” Marre says. However, the query volume may continue to be high for orthopedics, surgery, and OB/GYN because of the increased specificity required for these codes, she adds. At Steward Medical Group, physicians in each of these specialties will receive documentation guides and additional specialty-specific education. In addition to the added specificity inherent in some of the ICD-10 codes, there are guideline changes that could prompt queries. For example, the rules for reporting subsequent acute myocardial infarctions (ie, coders will need to know whether a second myocardial infarction occurs within four weeks of the initial event) could raise questions. Although ICD-10-CM/PCS is more specific, it doesn’t necessarily give coders carte blanche to query physicians, says Gail Smith, MA, RHIA, CCS-P, CEO of Gail I. Smith Consulting in Cincinnati. “I don’t think you can take every code that’s expanded and perform queries on it,” she says, adding that queries must be clinically relevant and validated in the record. Coders can’t report unspecified codes in ICD-10-CM/PCS. Although ICD-10-CM includes unspecified codes—and coders technically have the option to report them—these codes shouldn’t be the default option in lieu of more specific documentation. Generic and nonspecific information is not the goal of the new coding system. Smith says, in some instances, it may be appropriate to report an unspecified code. For example, an unspecified code may be valid if the physician can’t identify the organism causing pneumonia. “You can’t code what the physician doesn’t know. It’s more than appropriate; it’s accurate coding,” she says. At Steward Medical Group, coders already are asking physicians to provide information that would circumvent reporting an unspecified code (eg, laterality). Physicians also receive ICD-10-CM documentation education during provider audits, while new providers receive this information during orientation. All ICD-10-PCS codes require seven characters. Unlike ICD-10-CM codes that range from three to seven characters, ICD-10-PCS codes require all seven characters. “If a PCS code is reported with fewer than seven characters, it will be invalid,” Mandley says, adding that if a particular character isn’t relevant to a procedure or doesn’t apply, the PCS table will indicate that coders should report a Z for that particular character. Physicians are opposed to ICD-10-CM/PCS. Although the AMA has vehemently resisted ICD-10 implementation, not every physician is opposed to the new coding system. Some who may appear resistant at first simply need a compelling explanation of its clinical relevance. At Steward Medical Group, Marre tries to focus on the clinical benefits of ICD-10-CM when talking with the medical group’s 950 physicians who work in various specialties. The physicians assign their own codes, which subsequently are verified by coders. Marre says other practices or medical groups may operate similarly or they may employ coders to code directly. Coders should prepare for headaches related to external cause codes. “The external cause codes are getting a bad reputation right now,” says Smith, who believes the anti–ICD-10-CM/PCS crowd is driving the anxiety surrounding these codes. Although these codes denote important information about injuries, the likelihood that coders will report the majority of them is low. “Some of them you’ll never use,” she says. Many of the external cause codes in ICD-10-CM (ie, V and Y codes) are obscure and probably will never be relevant to a clinical encounter, Mandley says. In addition, the federal government doesn’t require them, and there may not even be enough space on the claim to report them. Experienced coders can learn ICD-10-CM/PCS quickly. Although ICD-10-CM may be relatively easy to learn, ICD-10-PCS is anything but. “People are underestimating the amount of time it’s going to take to learn PCS,” Smith says. “If you’re not on board now, it’s almost too late to be an expert. You might muddle through it.” Although there are no formal published time frames, she estimates it could take one year or more to become expertly versed in ICD-10-PCS. • The same root operation is performed on different body parts as defined by distinct values of the body part character. • The same root operation is repeated at different body sites that are included in the same body part value. • Multiple root operations with distinct objectives are performed on the same body part. • The intended root operation is attempted using one approach but is converted to a different approach. “Much of what it describes doesn’t always feel comfortable for a coder,” Kuehn says. For example, when a physician performs four biopsies on the transverse colon, coders must report a code for each of those separate biopsies. “This doesn’t feel natural to a coder, and it’s going to be a challenge,” she notes. When allotting time for ICD-10-CM/PCS training, budget more for PCS than for CM, Smith says, adding that hospital inpatient coders should plan to spend 75% of their training time on ICD-10-PCS. “CM is really an extension of ICD-9. If you know ICD-9, ICD-10 is really not that difficult,” she explains. “Coders will need to read the operative report very closely not only to determine the root operation but also to determine how many root operations are involved in the entire procedure. It’s going to be extremely difficult,” Mandley says. Note that Appendix A in the ICD-10-PCS Reference Manual includes root operation definitions, examples, and explanations. Coder productivity will decrease once ICD-10-CM/PCS takes effect. Expect this to come to fruition, Mandley says. The bigger questions are by how much and for how long? “[Productivity] will be affected more so than people thought,” she says, adding that she has seen estimates indicating a possible decrease of as much as 80%. The sooner coders can learn ICD-10-CM/PCS and practice using the codes, the more likely they’ll be able to mitigate any decreases. “I think people need to start using it now, even if it’s just coding one chart per week,” she says. Because they won’t be able to look at the title of the operative report and quickly choose a code, Kuehn says ICD-10-PCS may hamper coders the most. PCS requires an in-depth knowledge of the procedure as well as its intent, she adds. For example, encounters for physical, speech, and occupational therapy incorrectly map to a nonspecific code for encounter for other specified aftercare (Z51.89). Coders should not report this code, Smith says. Instead, they must report the reason the patient is receiving therapy. Mandley also notes problems with GEMs, pointing out that some ICD-9-CM codes (eg, V64.41 to V64.43, closed surgical procedures converted to open procedures) don’t map to any ICD-10-CM codes.